The year is 1415 and no it’s not Agincourt! 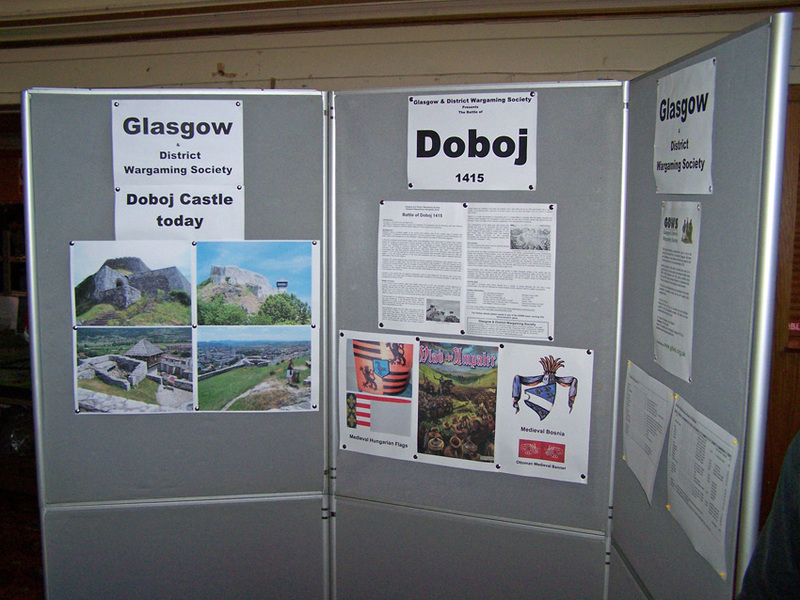 The Battle of Doboj was fought in August 1415 between the Hungarians and the Bosnians with their Ottoman allies. Doboj is situated in northern Bosnia where the Rivers Bosna and Usora join. Medieval Bosnia consisted largely of the central and northern area of the modern state of Bosnia and Herzegovina. It bordered Croatia and Slavonia to the north (mostly under Hungarian control) and Serbia to the west. Venice held possessions on the Dalmatian coast as did the city state of Dubrovnik (Ragusa). In the early medieval period Bosnia largely came under Byzantine control interrupted by invasion from Croatia, Serbia and Bulgaria. An autonomous Bosnia emerged in the early 13th century. Religious issues formed the excuse for Hungarian interference in Bosnia with claims (disputed by modern research) that the Bosnian church was controlled by heretical Bogomils. Ban Stjepan Kotromanic (1322-53) developed Bosnia’s autonomy under nominal Hungarian rule. Bosnia’s high point came under Ban Tvrtko 1 (1353-91). He consolidated the state and captured Serbian territory including most of the Dalmatian coast and parts of Croatia. In 1377 he even claimed the Serbian crown and Bosnian rulers thereafter used the title King. After his death in 1391 the central authority of the King was weakened and the nobles gained regional autonomy particularly in the frontier regions. The early 15th century Balkans were dominated by Ottoman expansion and Bosnian rulers played a role in the coalitions formed to resist them. The first raid into Herzegovina was repulsed in 1388 and Bosnian forces supported the Serbian Prince Lazar at the battle of Kosovo Polje the following year. Bosnian nobles reasserted their autonomy in the early 15th century some supporting the Hungarians and others were allying with the Ottomans or their vassals in Serbia. The main Bosnian noble families manoeuvred for position and were often more powerful than the King. Hungary in this period was the regional superpower ruled by King Sigismund. He was the ruler of the Holy Roman Empire and these wider European responsibilities impacted on the reources available to deal with his troublesome southern border. In 1412 Bosnia was at peace under King Stefan Ostoja who in 1411 had submitted to King Sigismund of Hungary. This peace included the leading Bosnians, Hrvoje, Sandalj and Radenovic. However, 1413 Hrvoje attacked Sandalj while the latter was fighting the Turks in Serbia and Sigismund declared Hrvoje a rebel. In May 1414 the Turks launched a major raid into Bosnia with 30,000 troops plundering the lands of Ostoja and Sandalj. The Turks proclaimed an illegitimate son of Tvrtko as King with the support of Radenovic. Hrvoje also called on support from the Turks and recovered territory taken from him by Sigismund. In the summer of 1415 Sigismund responded and a general levy was proclaimed of the Hungarian barons. What is described as ‘a great army’ led by John Garai and John Maroti marched into Bosnia and met Hrvoje and his Turkish allies commanded by Isa Bey. 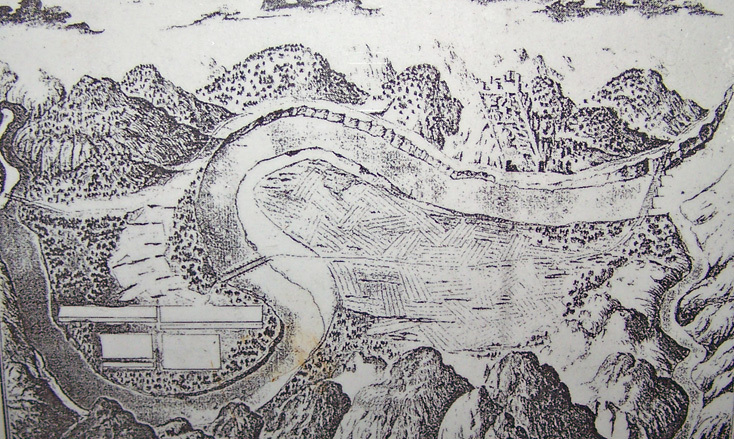 Most historians agree that the battle took place near the fortress town of Doboj in the area of Makljenovac in the valley of the River Bosna. We know nothing of the actual battle other than the Hungarians were heavily defeated. Many were executed and others ransomed for 65,000 florins, a huge sum that required an extraordinary tax to pay it. One Hungarian noble who had mocked Hrvoje’s stocky stature by imitating a bull when he entered court was sewn into an ox hide and thrown into a river to drown, “If you bellowed like a bull when in human shape, now you have the shape of an Ox in which to bellow” said Hrvoje. Doboj is in a plain surrounded by mountains and it is reasonable to suppose that the lighter Bosnian and Ottoman troops harassed the Hungarians in their journey through the mountains before they debouched onto the plain. 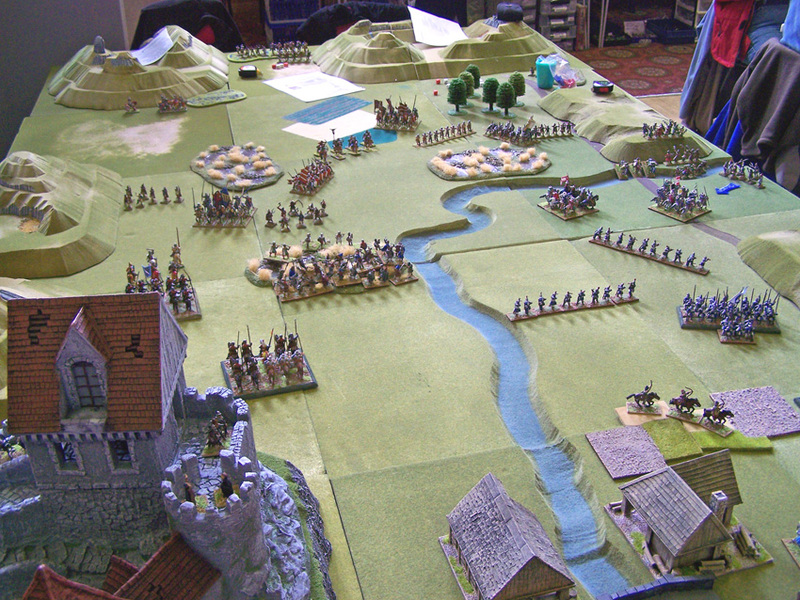 This is the basis of the scenario presented in this demonstration wargame. The consequence of the battle was that Ostoja and Sandalj went over to the Ottomans and this marked the end of Hungarian influence in Bosnia until the 1430’s. Radenovic was killed by Ostoja later in 1415 and Hrvoje died the following year. The leading Bosnian families continued to war amongst themselves with Ottoman and Hungarian support until the Ottoman conquest in 1463. We know relatively little about how the Bosnian armies were constituted and equipped. The army would be made up largely from the contingents of the nobility, supplemented by some mercenaries, funded from Bosnia’s mineral wealth. From the Bosnian stecaki (gravestones), royal seals and the limited exhibits in the National Museum it appears that they were organised and equipped similar to the Serbs, although with Hungarian and even Italian influences (via Dubrovnik) in armour. 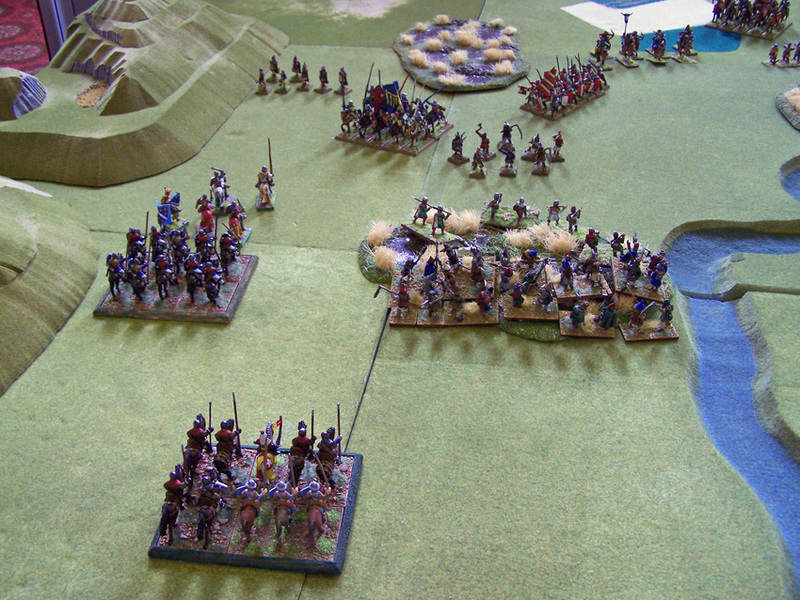 The army composition in this game is largely based on the Serbian lists in the WAB supplement and somewhat conjectural, but gives a flavour of the forces available. Essentially the Bosnian army is a lighter version of their Serbian and Hungarian neighbours to reflect the mountainous terrain. The Ottoman allies would be an expanded raiding force largely based around Sipahi cavalry supported by Akinci light horse. The Hungarian army (with Bosnian allies) was similar to other European armies of the period with the exception that they had access to quality light cavalry. 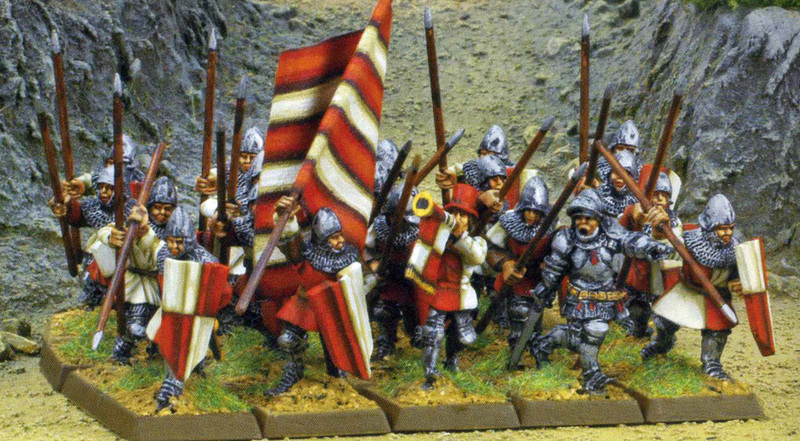 As we know the Hungarians called out the levy for this campaign the infantry base would be the militia spearmen and archers drawn from the free peasantry (Jobbagy) together with light skirmishers and crossbowmen. 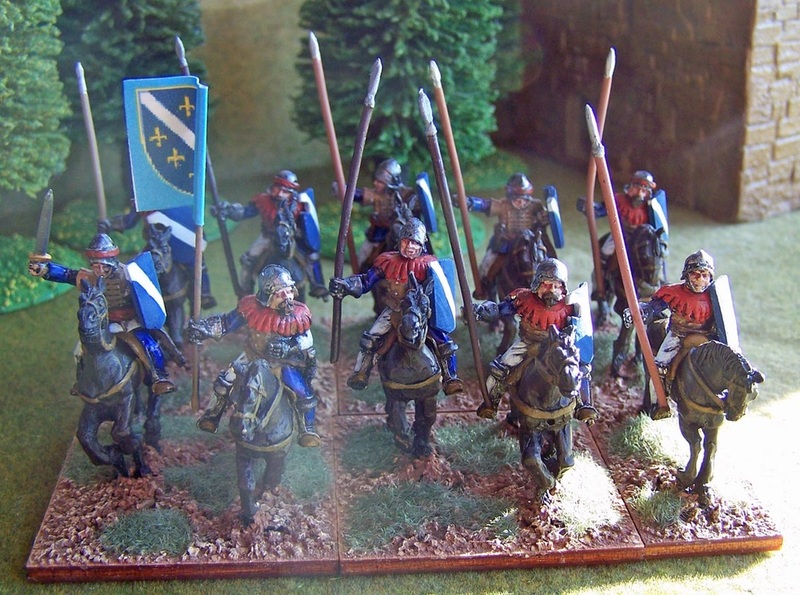 The arm of decision would be Hungarian and German knights supported by Szekler and Cuman light horse. 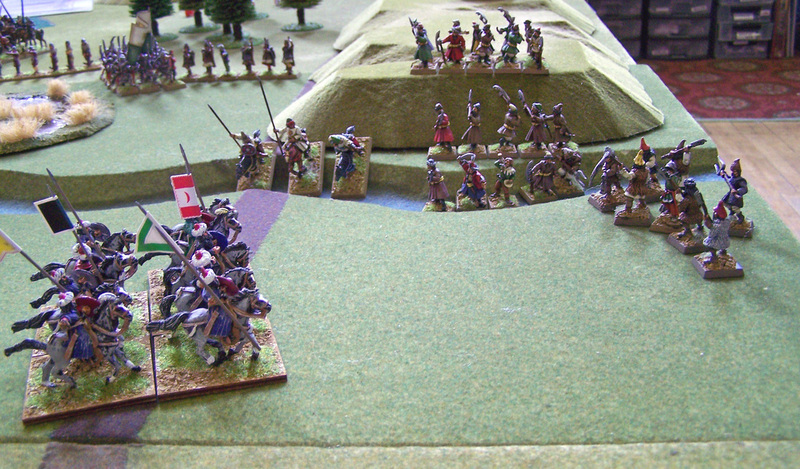 The battle is re-fought using 28mm figures from a variety of ranges although the Old Glory range predominates. 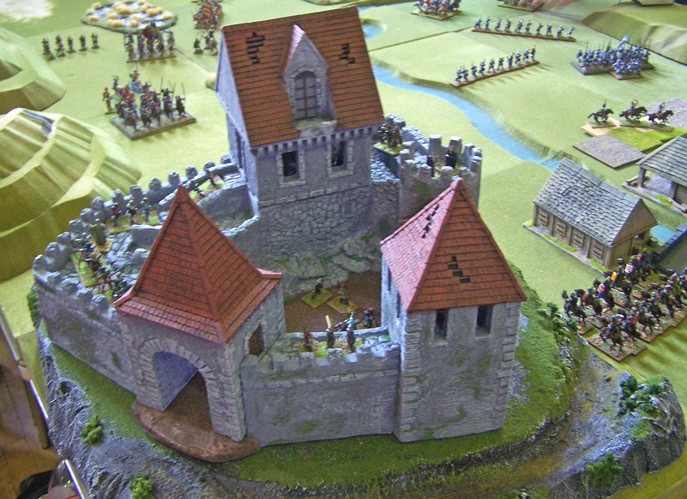 The rules are Warhammer Ancient Battles (WAB) using the Vlad the Impaler supplement.